Thousands of Venezuelans living in Chile protest against Nicolás Maduro, January 23, 2019, in Santiago. Venezuela may be on the verge of upheaval, as a crisis of political legitimacy threatens to undermine the socialist government of Nicolás Maduro. The chaos in Caracas stems from major underlying economic problems that have been worsening for years. Eleven South American nations, including Brazil, Argentina, Colombia, Chile, and Peru, along with the United States and Canada, are openly backing opposition leader Juan Guaidó. The 35-year-old head of the Venezuelan National Assembly declared himself acting president on January 23, calling for new elections to be held. Maduro, who was first elected president in 2013 to succeed Hugo Chávez, is clinging to power with the support of the country’s forces of law and order. His reelection in May 2018 to another 6-year term was condemned for coercion and vote-rigging. Venezuela has been wracked by severe shortages of food, medicines, and basic goods like milk, flour, and toilet paper and by disruptions due to power outages and cuts to the water supply. Inflation in the country topped 1 million percent last year! Unemployment and violent crime have soared. In 2001, Venezuela was the richest country in South America, but since 2014 more than 3 million of its people have fled the country. Widespread demonstrations protesting Maduro’s policies have brought people into confrontations with security forces. More than a dozen have died in recent clashes. Venezuela ranks last in economic freedom among 32 countries in the Americas. Economic sanctions imposed by the United States could make matters worse. And Maduro does have some allies—especially among the globe’s authoritarian regimes: Putin’s Russia, Erdogan’s Turkey, Cuba, and China. The political uncertainty is likely to result in even more civil strife and repression by the Maduro regime. The loyalty of the armed forces will be key to the outcome of the crisis. Article describes the political chaos in South America’s fourth-most-populous country. Background to Venezuela’s economic and political crisis. 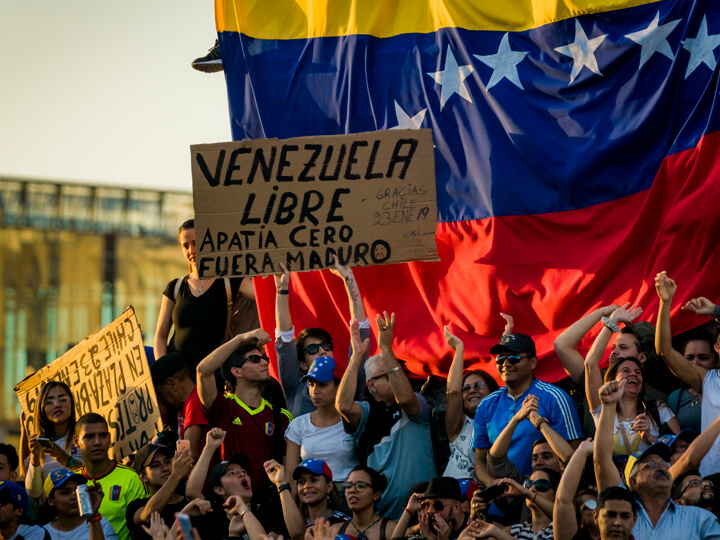 Report tracks developments that led to Venezuela’s economic and political crisis. Report on Venezuela’s economy from the Heritage Foundation’s 2019 Index of Economic Freedom. Article discusses the current U.S.–Venezuelan diplomatic riff. Update to the crisis in Caracas that caught the world’s attention on January 23.